There are many factors to consider if you are thinking about opening a bounce house rental business. You are probably already aware that bounce houses are always in demand for parties and special events. They are the #1 form of entertainment for kids who love to jump around and have fun. In addition, parents are a huge fan of bounce houses because they are safe and give them a well-deserved break from the kids. If you are considering starting a bounce house rental business, your first question is probably where to buy bounce houses. Bounce houses are not a cheap investment. In can be tricky understanding what to look for when searching for where to buy bounce houses. Before diving into your first bounce house purchase, make sure you do your research about the company you are considering. They should be professionals who have been in the business long enough to be reliable and dependable. In addition, their products should be of high quality. This is where Ultimate Jumpers, Inc. comes in. Let’s take a look at some facts about this company that make it one of the leaders in the inflatable unit manufacturing business. The founders of Ultimate Jumpers, Inc. have been in the inflatable manufacturing business for more than 7 years. They use 18.5 oz vinyl and have professional level equipment for cutting and sewing. This makes the units dependable and long-lasting. All of the units are sewn with polyester threads with triple and quadruple stitching in most stressed areas. In addition, the Ultimate Jumpers, Inc. customer service staff is very knowledgeable and friendly. 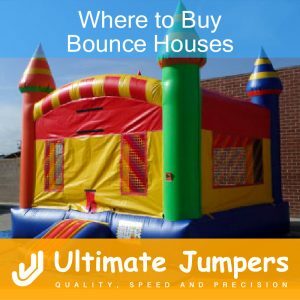 Whether you are a start-up bounce house rental business or you are looking to expand your bounce house inventory, UltimateJumpers.com has every kind of bounce house you could imagine. Just glancing through the website, you will be able to understand why they are so popular. They offer amazing warranties as well, and their prices cannot be beat. What more could you ask for? Now you know one of the best places where to buy bounce houses!